This track is a follow on from my Bluewaterholes Track found here. This is a fairly easy track from Coolamine Mountain Camping Area in the Kosciuszko National Park to the Mickalong Creek Camping Area near Wee Jasper. Coolamine Mountain Campsite has a water tank, Modern Pit Toilets and is only 2 Km form the Coolamine Homestead and 5 Km from Bluewaterholes. Camper trailers can do this trip but would be a little dificult in the wet. 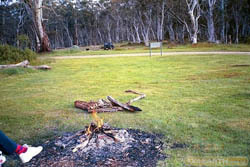 Mickalong Creek is approx 8 Km from Wee Jasper and has Picnic Tables,Toilets and a cold Shower. A small creek runs through the campsite. Caravans can be brought in easily from Yass to Wee Jasper and on to Mickalong Creek.